Take a trip down memory lane with me as we explore 23 Asian snacks that I grew up with! 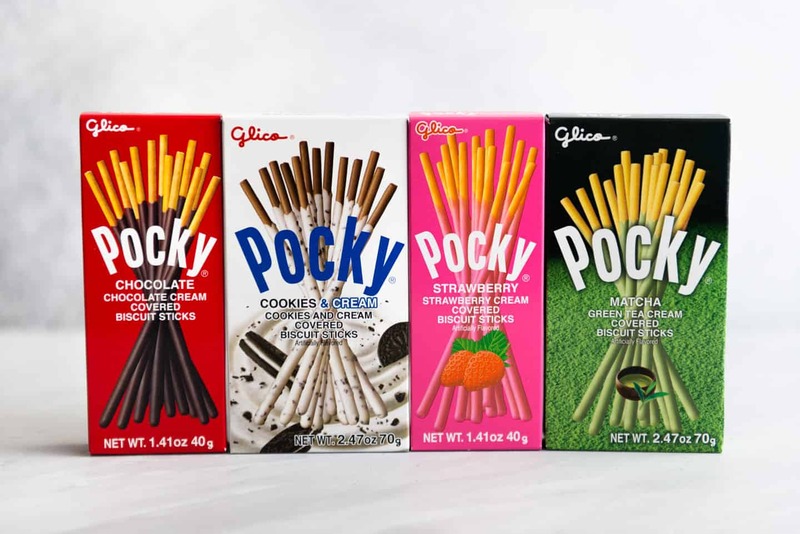 The genius behind Pocky is the way they are designed. There is about an inch of the biscuit that is not dipped in cream so that the cream won’t melt in your hands as you eat it. Genius. For this post, I ventured out and tried the cookies and cream and matcha flavors. I’m sad to report that they were disappointing. The cookies and cream variety had absolutely no flavor; it wasn’t even sweet. Despite depicting chocolate biscuit sticks on the package, there was no hint of chocolate flavor in them. Plus, the Oreo-like cookie crumbs depicted on the package created an expectation that the Pocky would taste like Oreos. Let me reiterate, they taste like nothing. I didn’t think that was even possible. The matcha Pocky was a slight improvement, but only by a thin margin. If I closed my eyes and ate the matcha Pocky, I wouldn’t have known that it was supposed to be green tea flavor. All in all, I think I’ll stick to my two favorite flavors. These are crunchy and light rice crackers that usually come individually packaged with 2 rice crackers. They are often lightly coated with some kind seasoning. I call these MSG crackers because it’s really the MSG flavoring that makes these crackers shine. You can find many varieties of these rice crackers, but the Bin Bin rice crackers (可口寶寶) are my favorite. I used to lick all the seasoning off each cracker before biting into it. Is that weird? 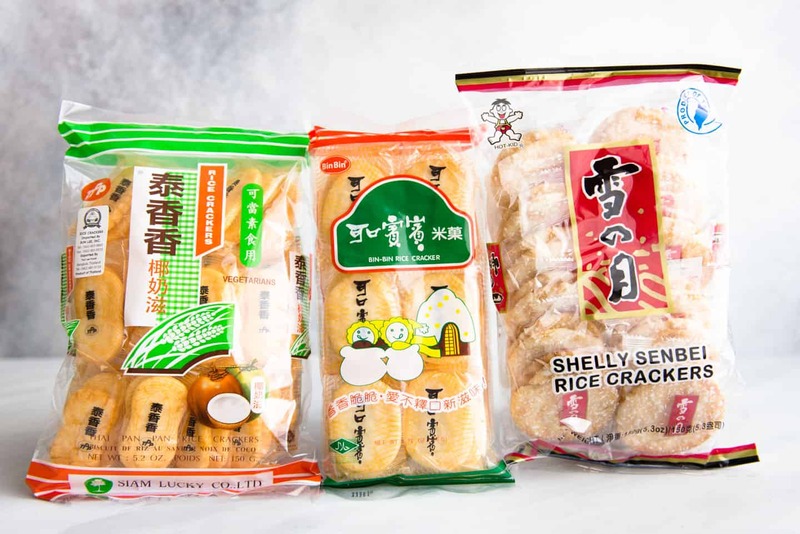 Other popular varieties are the Shelly Senbei rice crackers, which are similar to the Bin Bin crackers in flavor. However, there’s additional white frosted bits on the cracker to resemble snow. Finally, I also liked the Thai-style rice crackers, which have a slightly sweet coconut flavor. 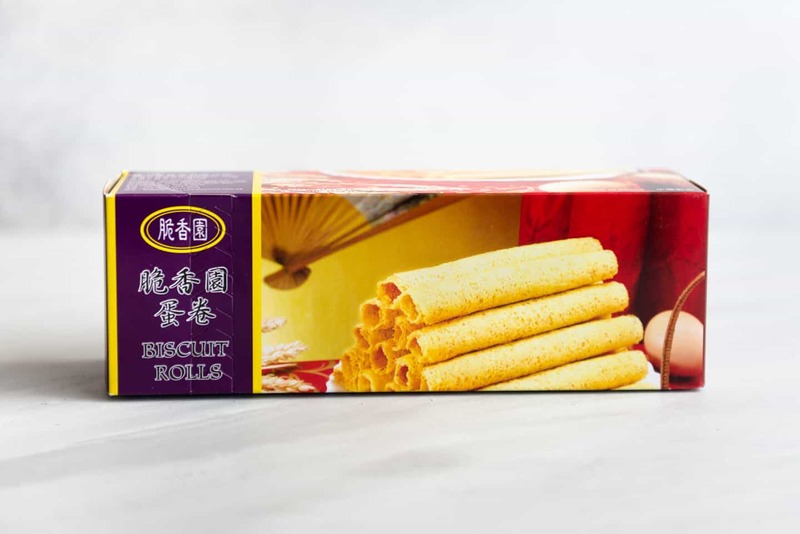 These packages of crunchy biscuit sticks and cream brought me so much joy as a kid. The only problem was that there was never enough cream in a package (probably around 3 tablespoons for 20 or so biscuit sticks). To ensure that you had enough cream for all the biscuit sticks, you needed to dip the sticks carefully, making sure to scoop out no more than 1/4 teaspoon of cream at a time. But if you portioned the cream carefully, sometimes, you will have an extra big dollop of cream left for the last biscuit stick. Yay! Yan Yan taught me the values of portion control and delayed gratification. In essence, they taught me lessons about how to be a responsible adult. My favorite flavors are chocolate and strawberry, but I bought the vanilla flavor to try for this post. I was very disappointed. The cream was sweet, but there was no vanilla flavor at all. Thumbs down. 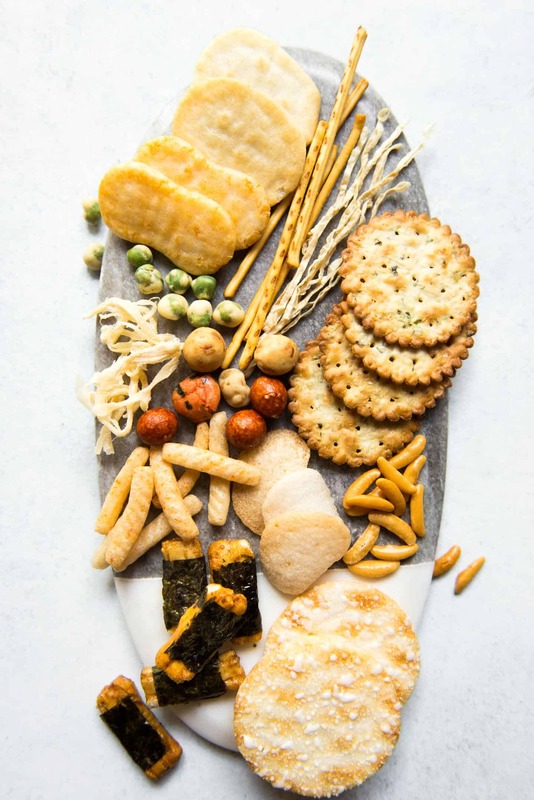 Fishnacks are fishy, light and chewy snacks. I’m not even sure what they are exactly, but they were so popular when they first hit Asian stores. Many people who don’t like fishy flavors or smells (like my husband) would be totally turned off by Fishnacks. 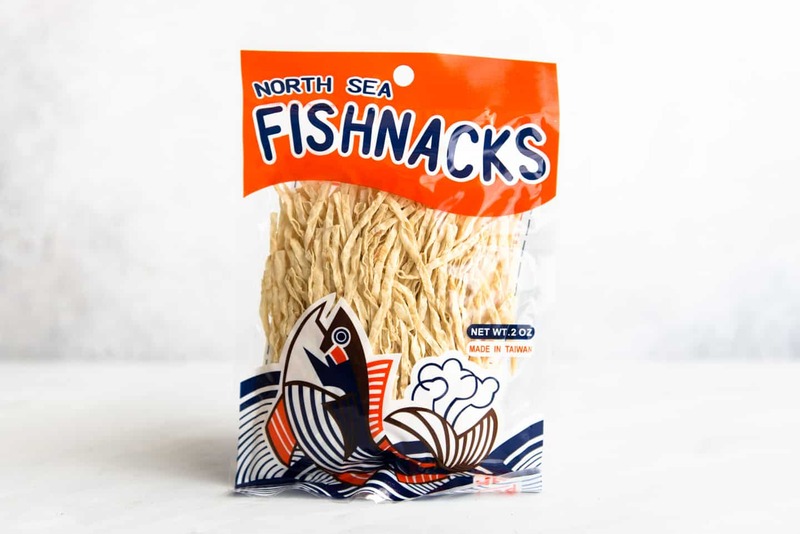 However, having grown up in an Asian household, where snacking on anchovies is completely normal, I LOVED Fishnacks. Bring on the fish! I’ve spent countless hours sitting in front of the television, mindlessly snacking on these things. Nostalgia can play tricks on the mind though. I haven’t bought a package of Fishnacks in years, and when I ate them again a few weeks ago, I was so disappointed, again. They are a lot drier than what I remember. I still love the fishy taste, but the texture did not leave me coming back for more. Any kid who has ever been subjected to eating Chinese medicine knows all about Haw Flakes (山楂餅). It was your prize after gulping a bowl of dark, bitter, why-do-I-have-to-eat-this Chinese medicine. Haw Flakes are made of hawthorn berries, which taste very similar to cranberries. When I was a kid, I thought they were made of cranberries because the Chinese phrase for cranberries and hawthorn berries (山楂) are the same. 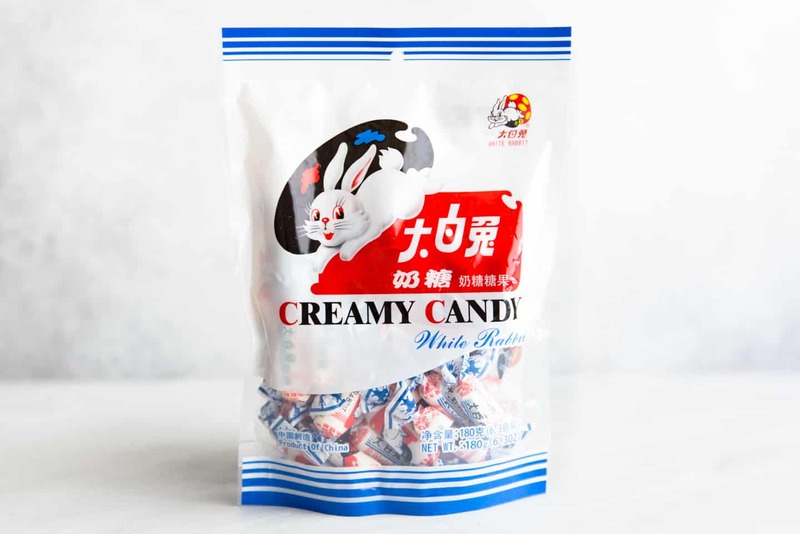 These were my snack of choice during college and my year abroad in China because all the sugar in them kept me awake for late-night study session. 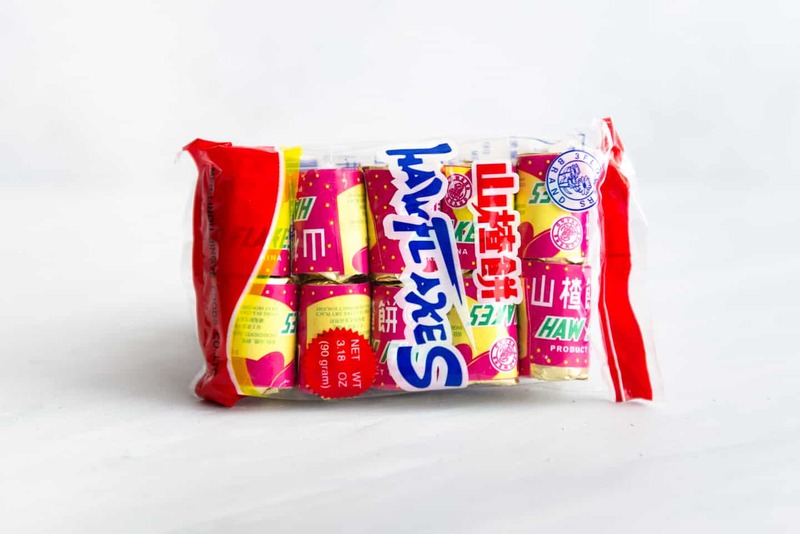 In China, it is very common to find haw flakes in larger sizes and fruit leathers with hawthorn berry flavor. My love for scallion-flavored foods began here. 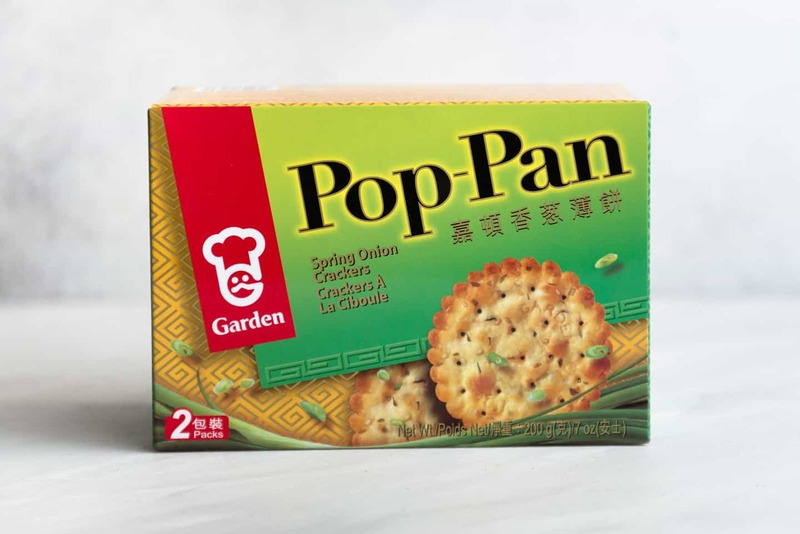 Pop Pan are buttery crackers that have scallion flavor. I can no longer eat too many of these at a time because the fat in the crackers leaves a strange coating in my mouth. 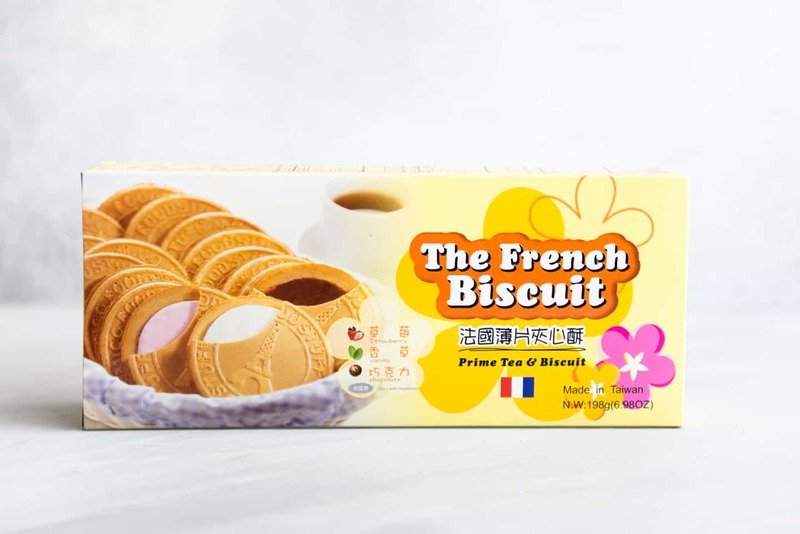 Besides the Eiffel Tower imprint on the biscuits, I don’t know why these are called French Biscuits. However, they were special treats that Mama Lin would only bring out if there were guests visiting us. I want you to take a look at the images on the box and focus on the rich layer of cream depicted. Now, take a look at the image below. Can you sense my dismay when I opened up one of these French biscuits? 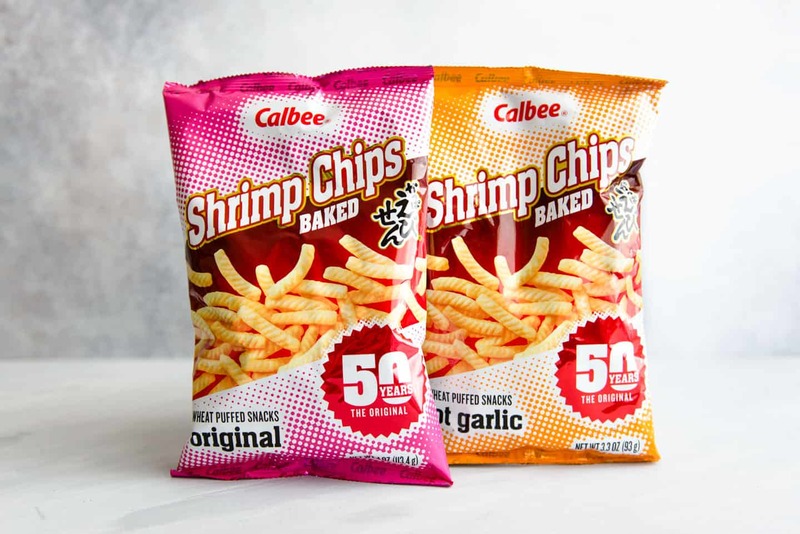 These crunchy, light shrimp chips were snacks that you’d share with friends. 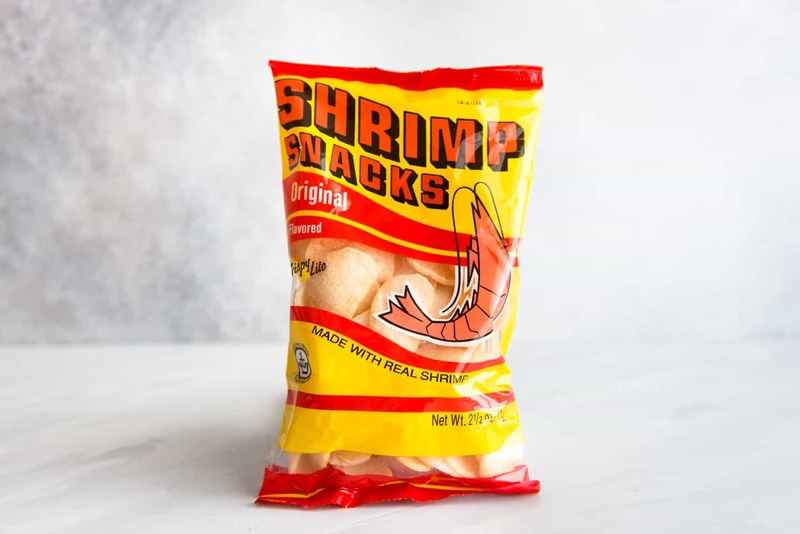 I loved sticking my nose into the bag and taking a good whiff of the shrimp flavoring. The chips are baked, which means we can eat more of them, right? 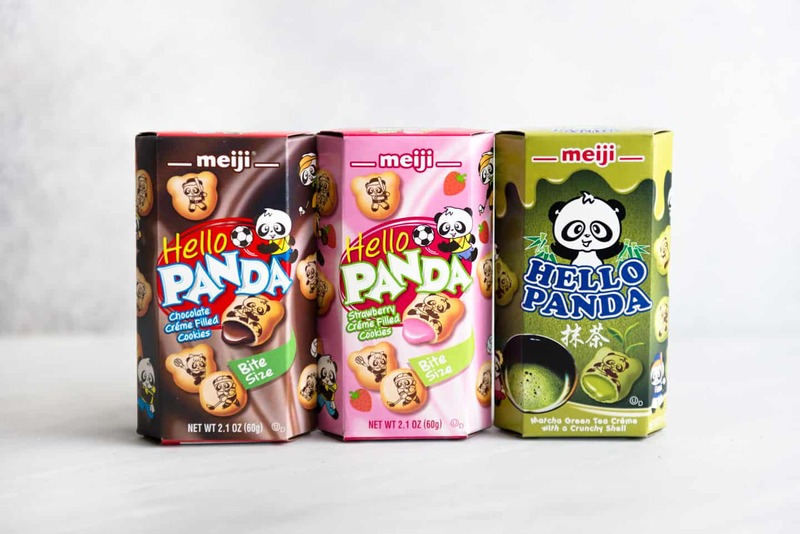 If you were a 90s kid, you know all about Hello Panda. 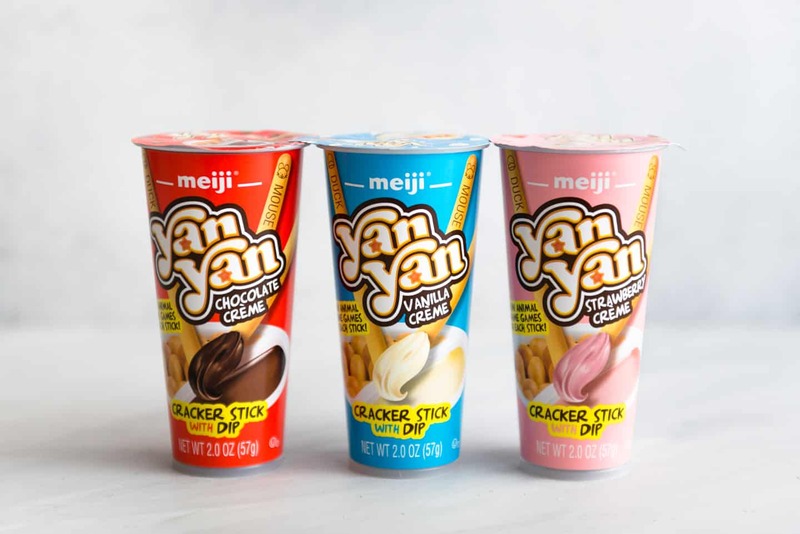 They are made by Meiji, who are the same manufacturers of Yan Yan. That’s why the biscuit and the cream tastes very similar. I never seemed to be able to find a cookie that had a perfectly printed image like the ones shown on the package, but they were tasty. I bought the matcha flavor for the first time a few weeks ago. The matcha flavor was not quite as disappointing as the matcha Pocky, but I definitely prefer the chocolate and strawberry. Are you noticing a pattern here? These Japanese-style rice crackers are a little more dense than the rice crackers mentioned above. Made with glutinous rice flour, arare are often flavored with a soy sauce-like seasoning. 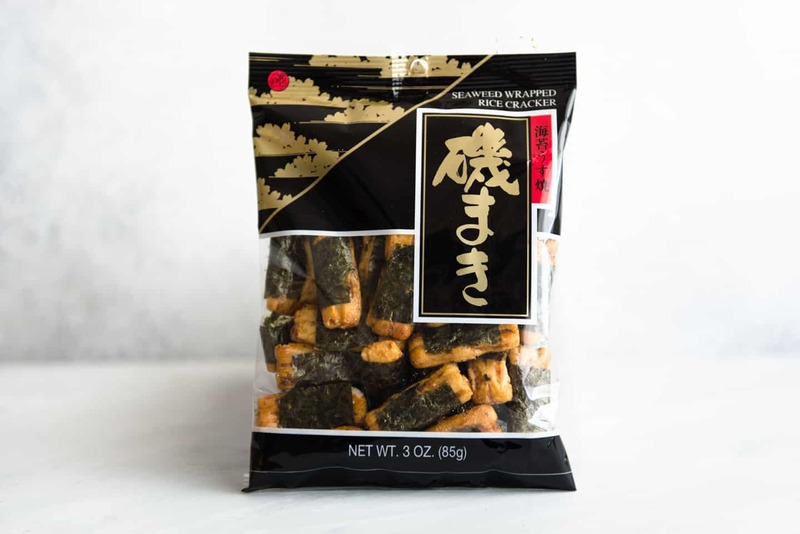 In this seaweed-wrapped version, the seaweed gives the crackers a nice umami flavor. This Japanese brand of gummy candies were not cheap, so my family would only buy a bag once in a blue moon. 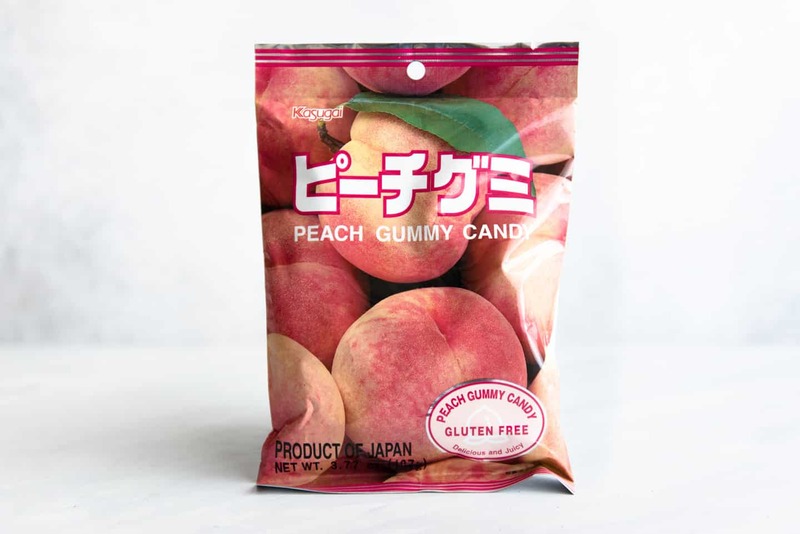 You can buy these candies in many different flavors, like mango, grape, and green apple, but peach has always been my favorite. Coincidentally, my husband loves these candies too, which means he usually wolfs down the entire bag before I even get a chance to eat a piece. These savory (very salty) biscuit sticks come in a few flavors. There is the green package, which is now called “Original.” Back when I was a kid, this was the “salad” flavor. Maybe they rebranded because someone finally tipped them off that they don’t actually taste like salad? 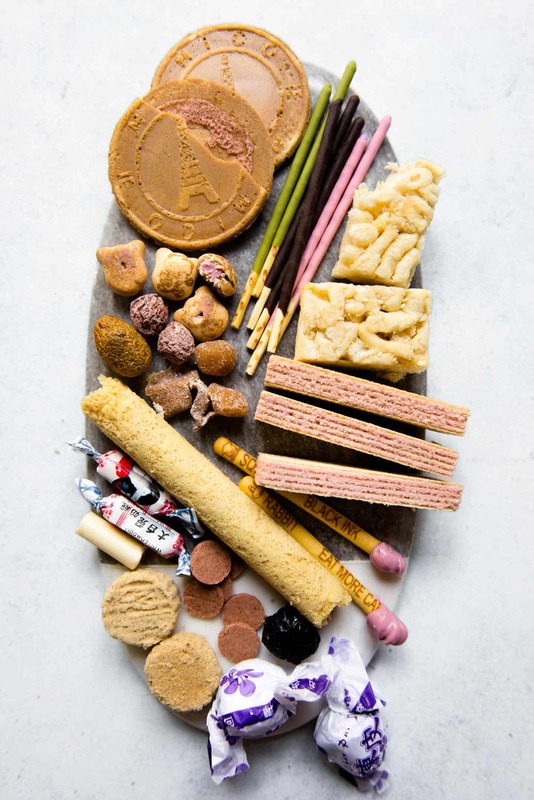 There’s also a “Roasted” Pretz, which is a plain biscuit stick (a bit boring, if I’m honest). 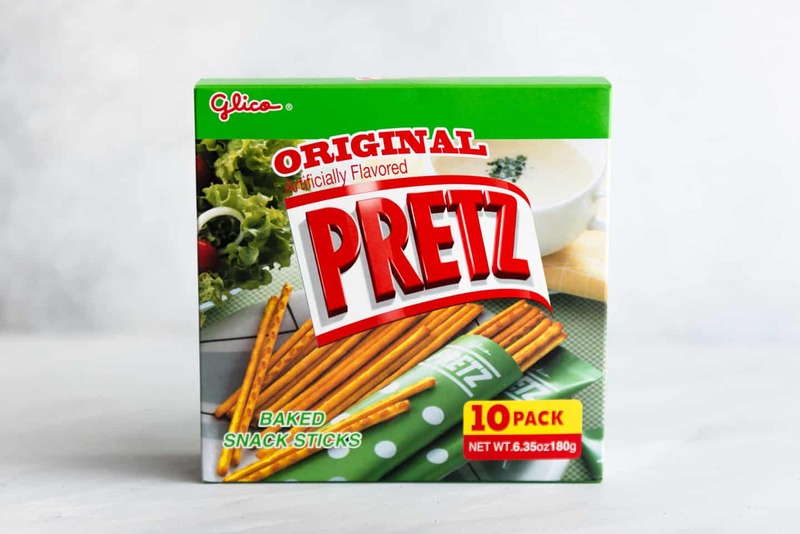 There’s also Tomato Pretz, which I haven’t tried before. Any of you familiar with Tomato Pretz? The Garden brand manufactures some of my favorite wafers. The actual wafer is airy and thin, and the cream has the perfect amount of sweetness—much less sugar than some American brands I’ve tried over the years. Garden Wafers come in a lot of different flavors, such as strawberry, orange, chocolate, coconut, lemon, and durian (ew). 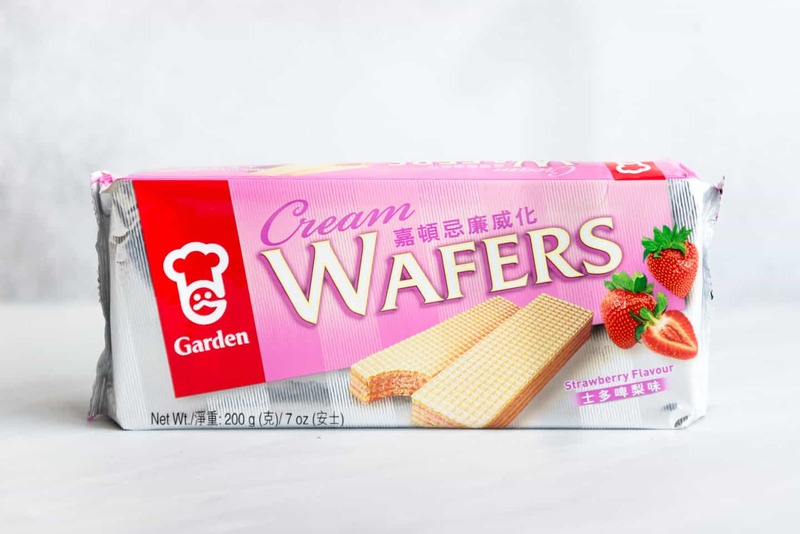 I have very fond memories eating Garden wafers with Grandma Lin. This was one of her favorite snacks because they were easy on her dentures. My ritual for eating these was to separate a cookie into their individual layers and then eat them one layer at a time. I clearly had OCD tendencies even at a young age. 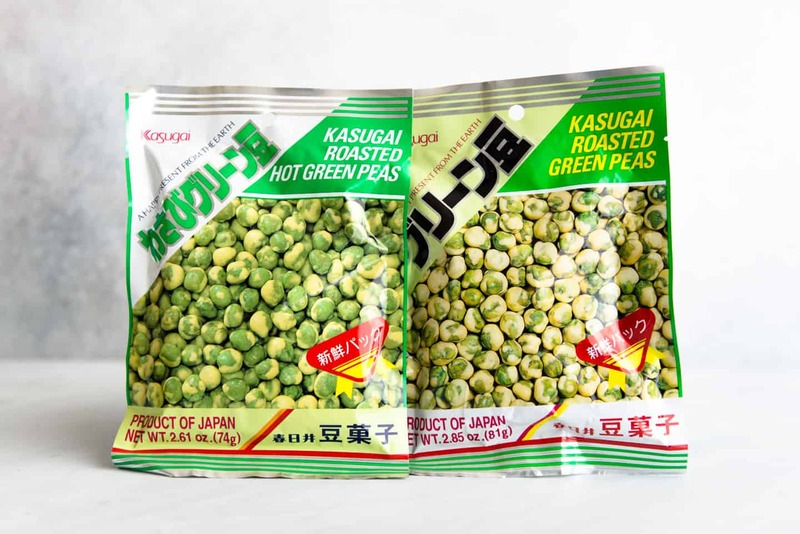 The roasted peas were my introduction to wasabi. I didn’t like wasabi then, and I’m not a big wasabi fan today. (The only time I’ll eat wasabi is when I’m eating sashimi.) The plain roasted green peas are ones that I can get down with any day. 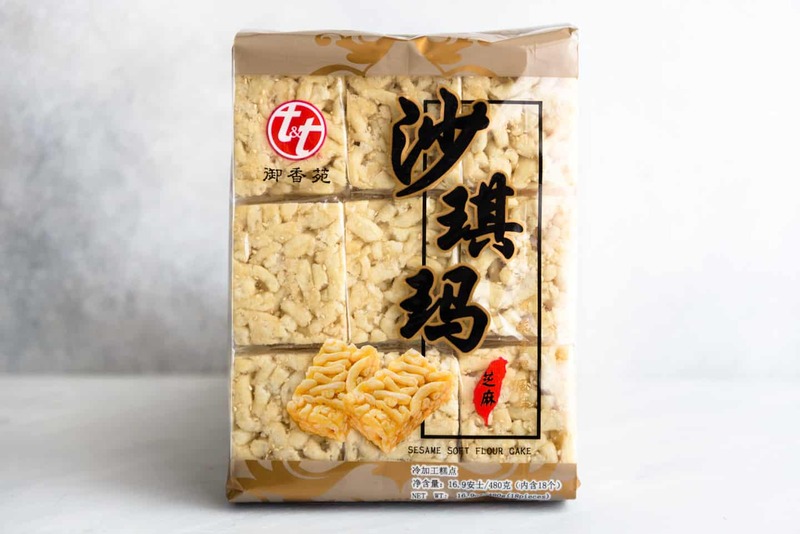 沙琪瑪 (sha qi ma) are similar in concept to rice krispies treats. They consist of small bits of fried dough that are held together by a sugar mixture. Grandma Lin loved these as well because they were nice and soft and easy for her to eat. This is another one of those snacks that I haven’t eaten in years, and I’ve discovered that I prefer fresh ones over the packaged version. 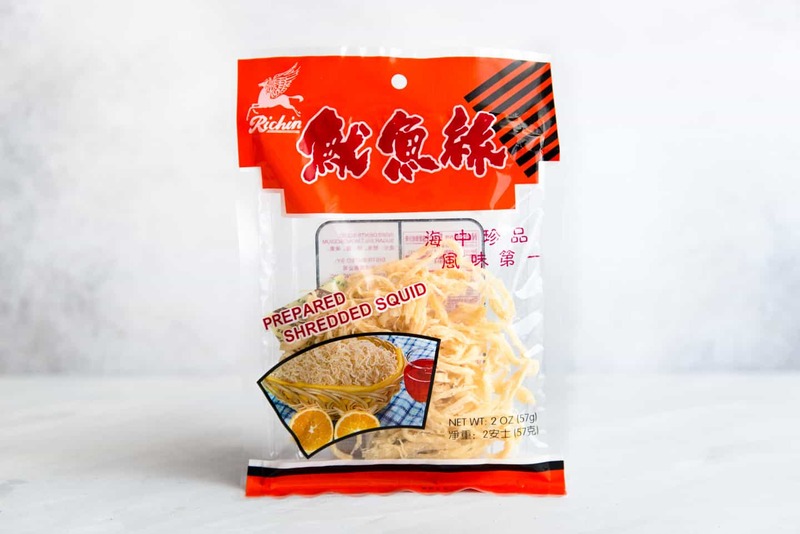 Oh yes, dried shredded squid. They’re soft and chewy and have a lot of umami flavor. Again, I spent many hours sitting in front of the TV while eating dried squid. I’m not entirely sure why there are images of oranges on the packaging, as I didn’t taste any orange while eating these. If you don’t like fishy foods, you probably won’t like these either. 蛋卷 (literally translated as egg rolls) are thin flaky biscuits that are rolled up. You need to eat these egg rolls over a plate or else the crumbs will land everywhere. We used to get them in a tin box when I was a kid. My favorite variety is the kind with a layer of coconut cream on the inside (not the ones pictured). More commonly known as prawn crackers, these are deep fried chips with shrimp flavoring. The fun part about these chips is that when you lay a piece on your tongue, you’ll feel a tingling sensation and hear faint popping sounds. It’s a bit like eating pop rocks. Mama Lin makes fresh prawn crackers for Chinese New Year, and they are such a treat. 盲公餅 (literally translated as blind man cookies) are tiny, dry cookies with toasted sesame and peanut flavors. 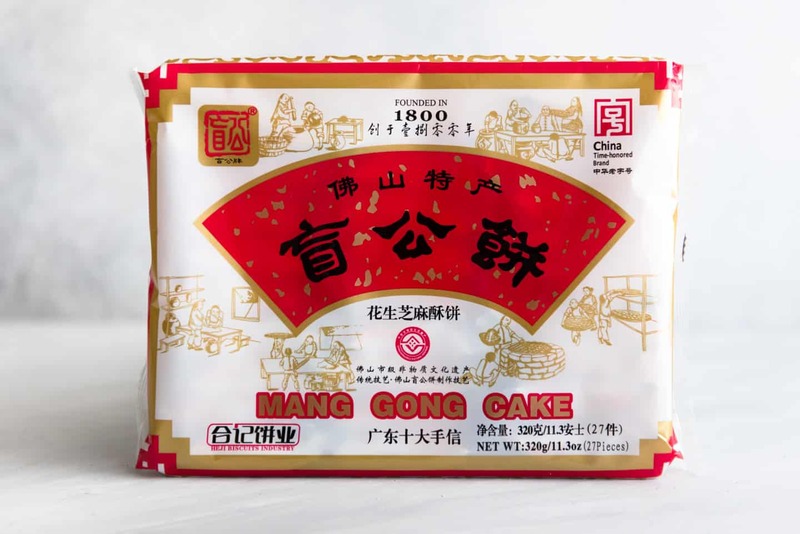 I loved these cookies as a kid because they are a regional specialty of Guangdong Province, which is where my family is from. Whenever I ate one of these cookies, I felt a strange sense of pride. They now come individually wrapped, which I think generates far too much waste. Oh well. 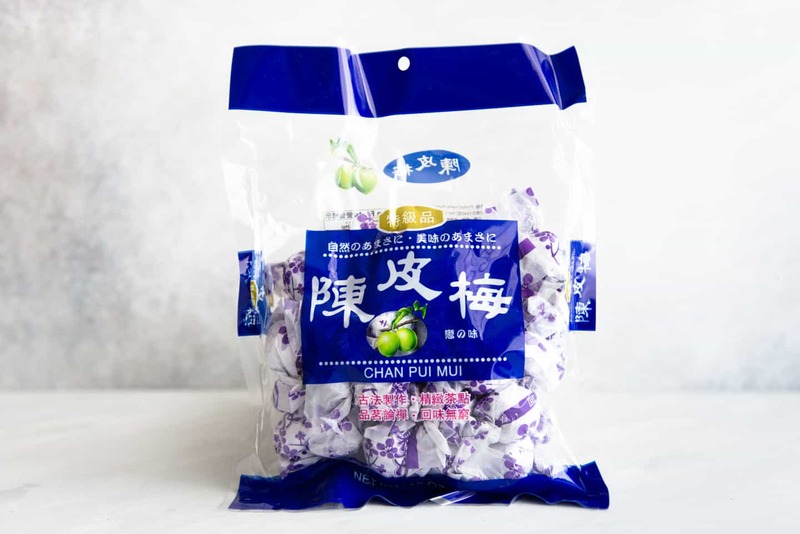 陳皮梅 (literally translated as mandarin peel plum) are candied plums that are flavored with mandarin orange peel. I love these candy because they contain hallmark Chinese flavors. 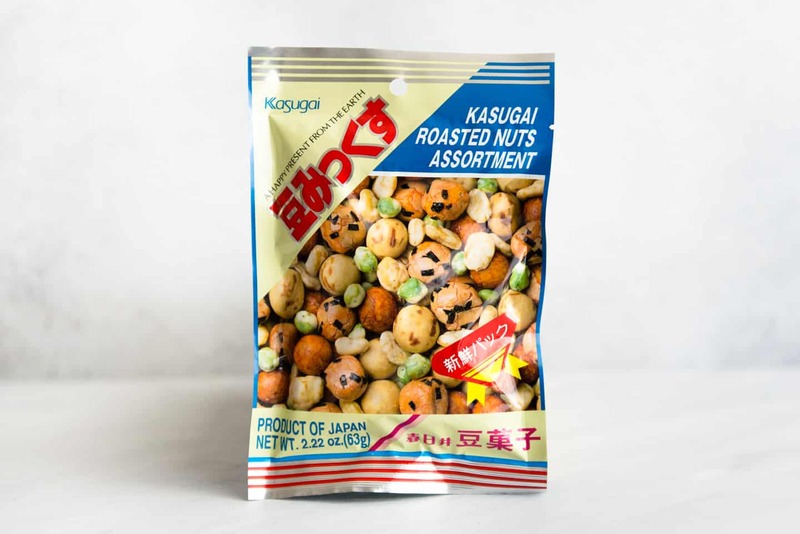 This nut mix contains some of the roasted green peas mentioned above. My favorite part of the mix, however, are the larger circular bits, which are usually peanuts covered in a batter. I can easily eat a bag of these in one sitting. I used to love these milky candies as a child. They are wrapped in a thin layer of rice paper that dissolves in your mouth. I ate one of these candies recently, and I was very disappointed, mostly because the candies are virtually impossible to bite into. Were the candies always like this? I’m lumping a bunch of preserved fruits in this category. A lot of these fruits tend to be sour, and I think they’re meant to trigger the glands underneath the tongue that cause you to salivate. That’s why they’re perfect to eat when you are feeling a bit parched. 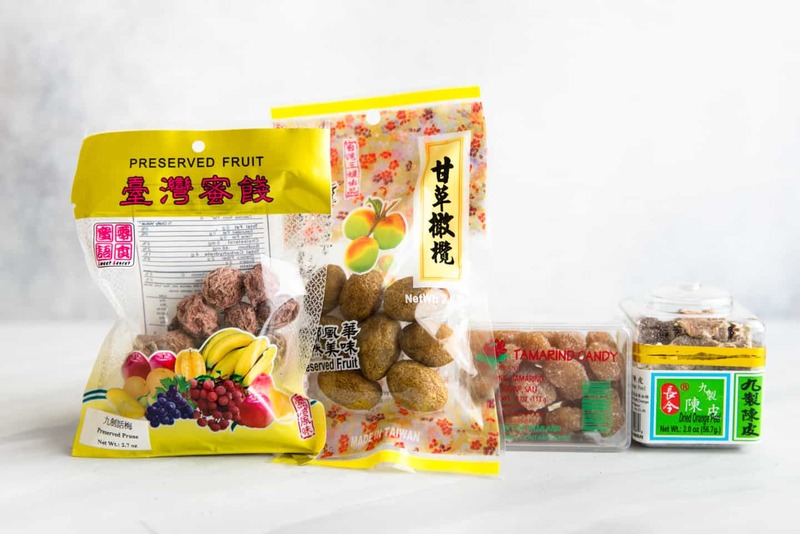 The package on the left is 九製話梅, which are preserved prunes. I actually hated these as a child because they’re way too salty and sour. I can’t say that my feelings about them have changed at all. The sweeter version, 甘草梅, taste much better. The next package is 甘草橄欖, which are sweetened preserved olives. The third package contains tamarind candy, which contain sour tamarind flesh rolled in a TON of sugar. Finally, we have 九製陳皮, which are preserved mandarin orange peel. This post has been one of my favorites to write because it gave me an excuse to buy all the Asian snacks and go down a trip on memory lane. 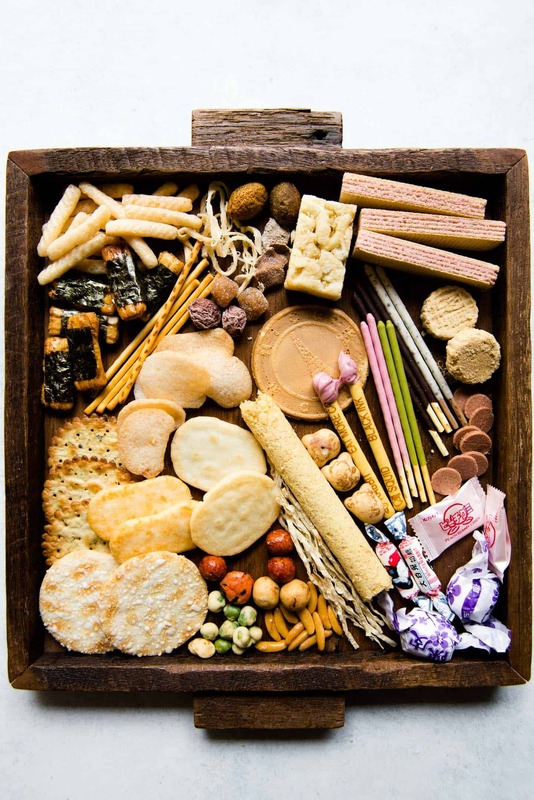 What Asian snacks do you enjoy? how could you leave out the rectangular pineapple cakes from Taiwan?!?! they came in a plastic sleeve of about 8 pieces, measuring about 1in x 1.5in. OMG YESSS!!! I totally forgot about those! Yum!!! I love that too! We bought the White Rabbits, they’re soft! I think you accidentally bought an old batch, something went wrong during shipping or maybe you have to warm them up a little? That’s definitely what I thought too, but many people have told me that they have a similar experience with buying the candy and thinking it is way too hard. I have been reading some online forums, and they may have changed the formula for the candy!